Here the front of a -still folded- advertisement sheet. It is a postal stationary. 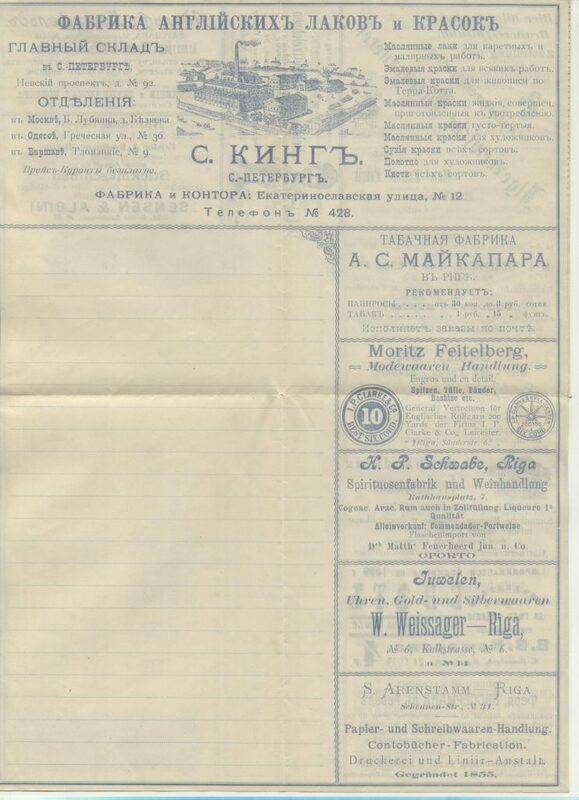 The cover is adressed to a certain Busch with address and notice (translated to Russian in another handwriting) that it is related to a pharmacy. a pelican, feeding her youngs with her blood. Also in Christian art, is a symbol of charity, it is even a mystic emblem of Christ. St. Hieronymus gives the story of the pelican restoring its young ones destroyed by serpents, and his salvation by the blood of Christ. Physiologus, about the year 200, and the foundation for the Bestiarium of the Middle Ages, tells us that the pelican is very fond of its brood, but when the young ones begin to grow they rebel against the male bird and provoke his anger, so that he kills them. In three days the mother returns to the nest, sits on the dead birds, pours her blood over them, revives them, and they feed on the blood. Maria Feodorovna (Sophie Dorothea of Württemberg) was the second wife of tsar Paul I and she lived from 1759-1828. She was the mother of tsar Alexander I and tsar Nicholas I. On May 2, 1797 she was appointed as head of the Orphanages. Also when her husband, tsar Paul I was murdered-1801- she continued to work in this function. The Chancellery (IV Department) of the tsarina continued the charity work also after the dead of Maria Feodorovna. The Chancellery sought ways to raise funds and so in 1898 the Chancellery launched the issue of ‘Charity letters in favor of orphanages’. The post-offices sold it for a reduced price, but had the money for the advertisements. The extra profit was for the orphanages, named after tsarina Maria Feodorovna (1759-1828). On the front of the sheet is placed on the left side the above mentioned emblem and the text above the emblem means ‘charitable’. On the front upside in red ‘This form is is sold everywhere for 5 kopecks’ Then: ‘Closed letter with advertisements’ and at the bottom: ‘The net proceeds go to the benefit of the departemental institutions of Empress Maria’. On the backside you see an advertisement and at the bottom the printing details and year of issue. 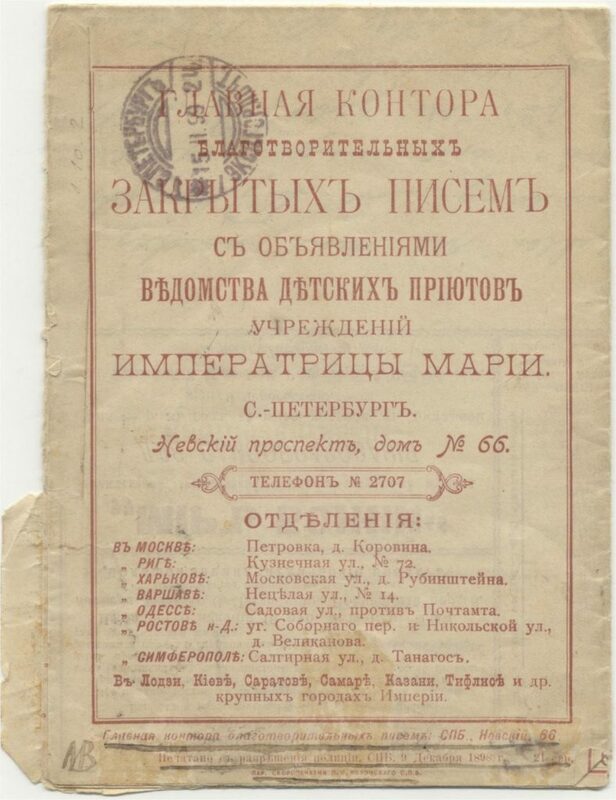 The advertisement is of the ИМПЕРАТРИЦЫ МАРIИ [IMPERATRITSY MARII], the Empress-Maria-Feodorovna-Institution itself, with the address of the office in St. Peterburg. Here we see the title Empress ИМПЕРАТРИЦЫ [IMPERATRITSY]: The official title Tsar (or czar) -Tsarina (or czarina) was the official title of the ruler of Russia, but in 1721 -under Peter the Great- the title is replaced by ‘Imperator’ (or Emperor’). In common usage still Tsar and Tsarina are used to 1917. Detail on the backside: the printing details and year of issue (1898). on the first line Head office of the charity-letters СПБ[SPB]: short for St. Peterburg, and address. Next line: ‘printed with the permission of St. Petersburg’ police’. St. Petersburg you read in the abbreviation: СПБ[SPB]. Followed by the date: 9 ДЕ..[DE]…December 1898 and the series is 21. The advertisement sheets are issued from October 1898 up to November 1901. The date of the first issued sheet is not clear. According to “Illustriertes Briefmarken Journal” -1898, p. 342) the first sheed is issued November 15, 1898. 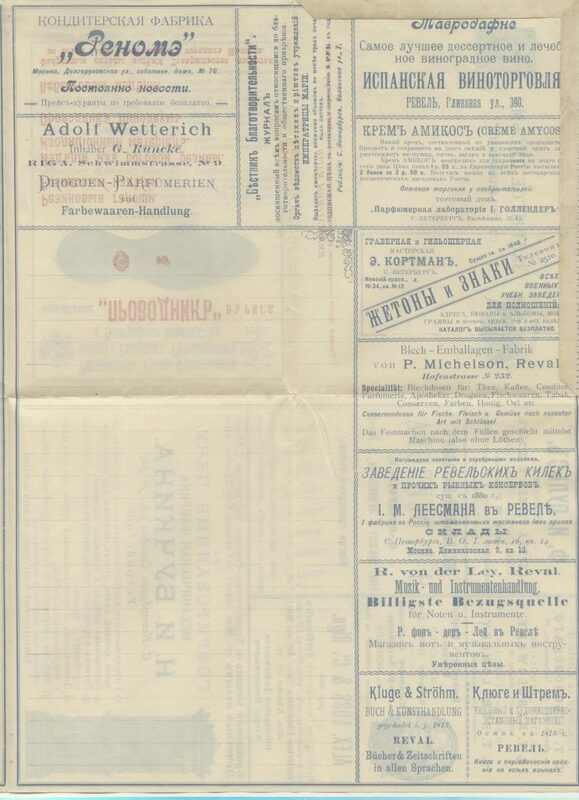 The “Deutsche Briefmarken Zeitung -1899, p. 11- gives another date: November 12, 1898. But the first reported postmark has as date November 9, 1898. But talking about dates: the Russian Empire used the old Julian calender to February 1918: for our calendar, which most countries also used in that period, 12 days must be added in the period after 28 February 1800 through 28 February 1900, and 13 days through 28 February 2100. Sheet number 1 and number 2, issued in St.Petersburg, have no date om the sheet for the permission of the police. This permission was necessary and on sheet number three is mentioned the date of the permission: October 21, 1898. The sheets for sending in the whole country – intercity letters- had a print run of 5000, the sheets for local use had a print run of 3000. In the beginning the Head office in St. Peterburg was the collecting point for the advertisements. Later there were sub-offices, which get the same function. The Head office had to buy the postal sheets from the State Printing House. 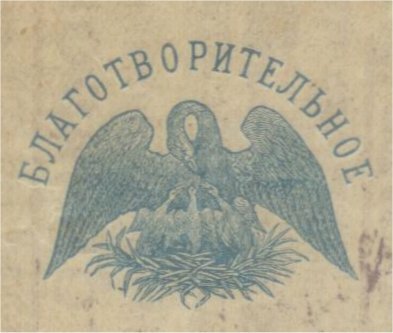 The address side was printed in advance by the State Printing House, included the imprinted stamp (5 or 7 kopecks) and the emblem with the pelican. Thw Chancellery of the Empress ordered postal sheets for more series together. Arnold Ryss has concluded -from the printing characteristicts -the used colors- that the most sheets are printed in St. Petersburg. The advertisements were -most cases- printed in one color (blue, violet, red or green). Total: 7 or 9 kopecks, but the prize was 4 or 5 kopecks. The difference must come from the advertisements. When the advertisements had not results enough for the advertisers: end of these very special postal stationeries. The advertisement sheet, here to see, is a ‘normal’ sheet. There are also sheets reported with deviations: advertisement sheets without printed address side, a proof (?) without imprinted postage stamp on the address side. Further of course there are typographical errors in the advertisements and -in some sheets- errors in the year of issue. As you can see here and above the letter sheet has as most letter sheets two narrow gummed strips for sealing the envelope. There is place left open for the message, usually three fields (about 125 x 256 mm). Charity letters bearing advertisements for the benefit of orphans (1898-1901) / by Arnold Ryss. – Moscow, Russia, published 2004 in English. – Review in Rossica 2006 ; 147. – p. 88. The introduction gives an overview (thanks to the library of Rossica!). De advertentiebladen van Rusland : onbekend, maar daarom niet minder interessant / André de Bruin. – In: Het Baltische Gebief 2002 ; 41. – p. 22-25. Folded it was the seize of a normal letter (about 148 x 107 mm), but totally open -3 times- it was 430-455 x 295-315 mm (about 2 x A4). Issued 1898:of issue is St. Petersburg. Or: Mi. 47: imprinted stamp 7 kopecks, blue (as Mi. 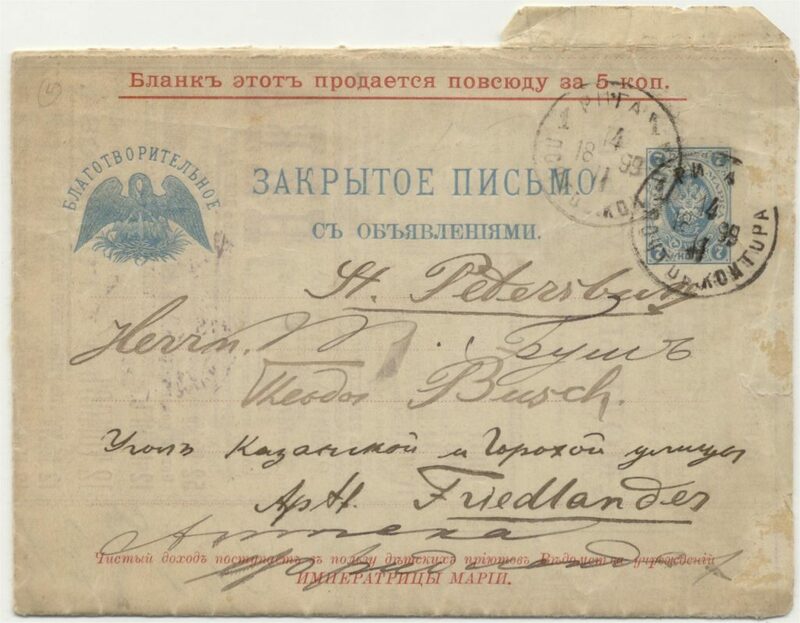 45), sold for 5 kopecks, serienumbers 1-5, place of issue is St. Petersburg.According circular number 80 of the Department of the Post and Telegraph these letters must be handled as other letters with postage stamp of 7 kopecks. This was the postal rate for domestic letters since May 20, 1879. The sheets could be sold everywhere, but not in the offices of the Department of the Post and Telegraph. 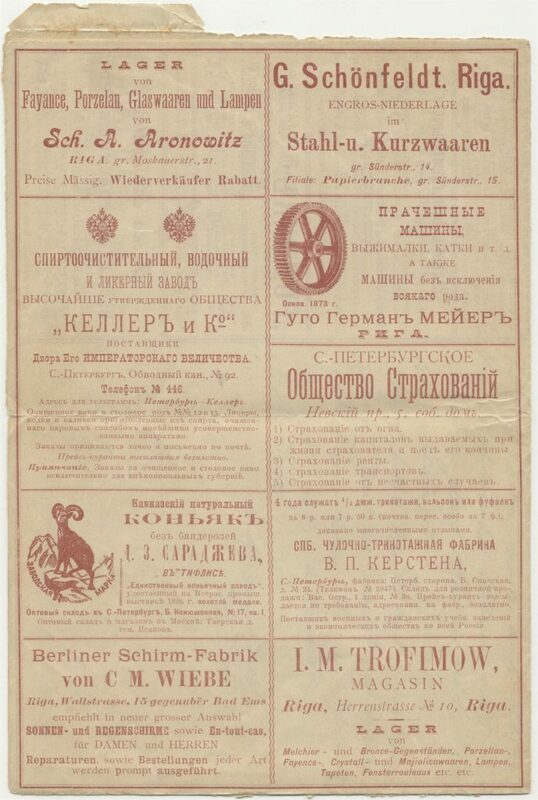 On the front is the text: ‘This form is sold everywhere for 5 kopecks’. Issued 1898/1899: imprinted stamp 5 kopeks (as postal stationery Mi. U 33), lila, sold for 4 kopecks, issues 1-11, for St. Petersburg and Moscow. The series numbers is some complicated. 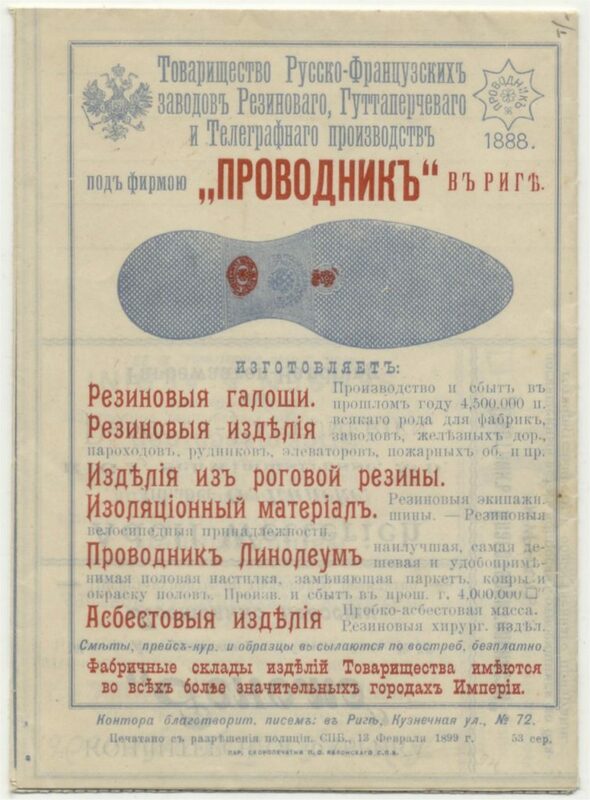 Circular number 58, May 20, 1899, announced the issue of advertisement sheets for local use in St.Petersburg and Moscow. This second type has an imprinted stamp of 5 kopecks, violet. Also the color of the emblem with the pelican is violet. 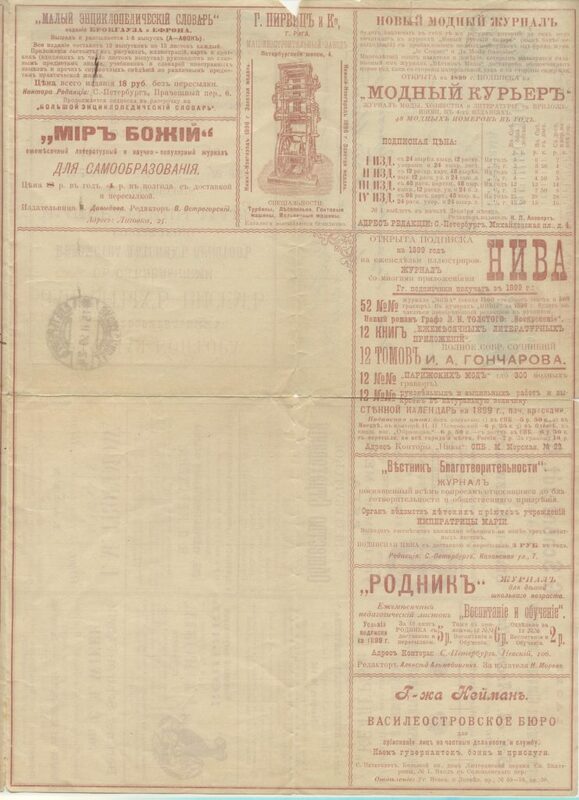 [article HBG says: 300 numbered sheets], for St. Petersburg, Moscow, Astrakhan, Ekaterinoslav, Kazan, Kiev, Odessa, Penza, Riga, Rostov-on-Don, Samara, Saratov, Simpheropol, Tambov, Tiflis, Ufa, Uralsk, Voronezh and Warsaw.The imprinted stamp of the sheet here, type 3. In the first article of Adler/Schmidt is described the transition of intercity letter sheets: from the first type (7 kopecks stamp of the 1889 regular issue) and type 3 (7 kopecks as postal stationery envelop Mi. U 33). The transition has gone without interruption. Series 5 (type 1) and 6 (type 3) have permission of the police on the same day. Even type 3 can be found on series 5. Some smart characters cut out the embossed stamp and used it on covers as regular postage. The price of the sheets was 5 kopecks, so they saved 2 kopecks. It was legally prohibited to use cut-outs from entires, but it was done. With type 3 it was clear that it comes from a postal stationery. According Arnold Ryss there are known 147 different charity letter sheets. There are also sheets reported with the same number, but different advertisements. There are also sheets without serial number or without year of issue. Arnold Ryss gives alde detailed information about the series numbers. For the first 76 issues numbers of the intercity letters is is simple: these numbers are located in the imprint area on the backside. Series 77 to series 82 inclusive the series number is placed on the address side. With 83 and 84 is becomes more complicated: series numbers on the address side and number 120 in the imprint. For further detail of the following series of the intercity letters: see Arnold Ryss. For the local letter sheets the catalogue of Arnold Ryss has catalognumbers local 1-11. The first three series numbers have this number on the address side, series 4 also but number 124 in the impriny, series 5 and 6 are indicated on the address side and after these is is again more complicated. For details: see Arnold Ryss. 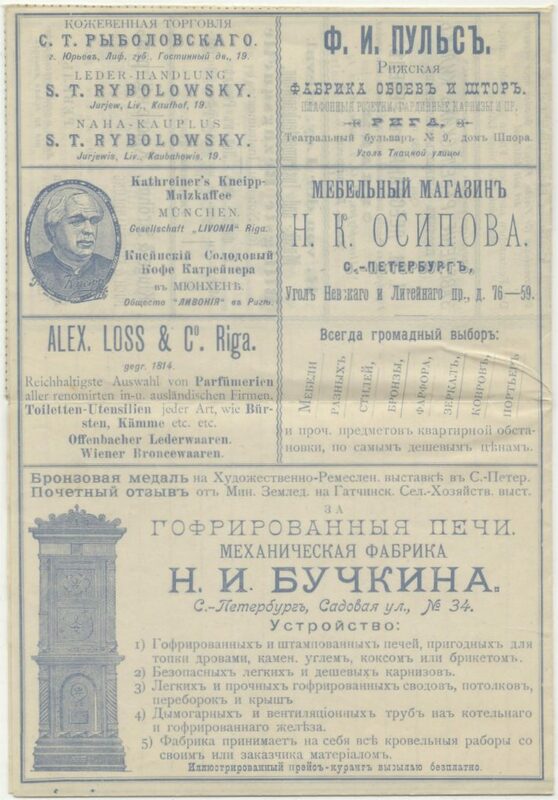 For the collectors of the Baltic the advertisements in sheets, issued in St. Petersburg, are interesting. Many advertisements are from companies in Riga and (also) in German. 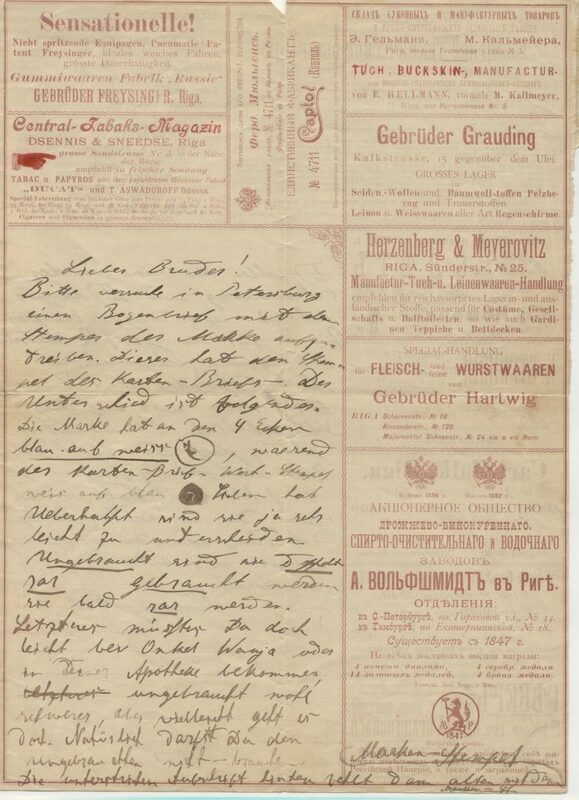 Also on this letter sheet: on the front upside in red ‘This form is is sold everywhere for 5 kopecks’ Then: ‘Closed letter with advertisements’ and at the bottom: ‘The net proceeds go to the benefit of the departemental institutions of Empress Maria’. Type 3 as the sheet above: imprinted stamp of 7 kopecks -intercity letter sheet- , like on the postal stationery U 33. At the bottom of the backside also on this sheet: the printing details and year of issue (1899). Next line: printed with the permission of St. Petersburg’ police. St. Petersburg you read in the abbreviation: СПБ[SPB]. Followed by the date: 13 February 1988 and the series is 53. The advertisement of S.T. 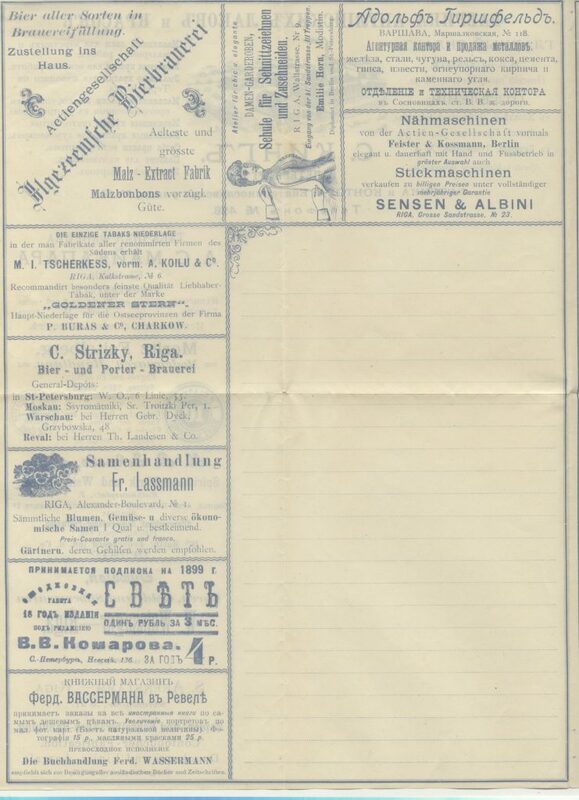 Rybolowsky -placed on this page at the top, left- is in three languages: Russian, German and Estonian (Naha kauplus=leather shop). The place is indicated in Russian as ЮРЬЕВЪ [YUREW]. Here the German indication of the place is more a transcription of the Russian name: Jurjew Liv. (short for Livland = Livonia). The usual German name of the plave in tsarist times was Dorpat, Derpt or Dörpt. Also the Estonian indication of the place is more a transcription: Jurjewis. Noe the Estionan name is Tartu. 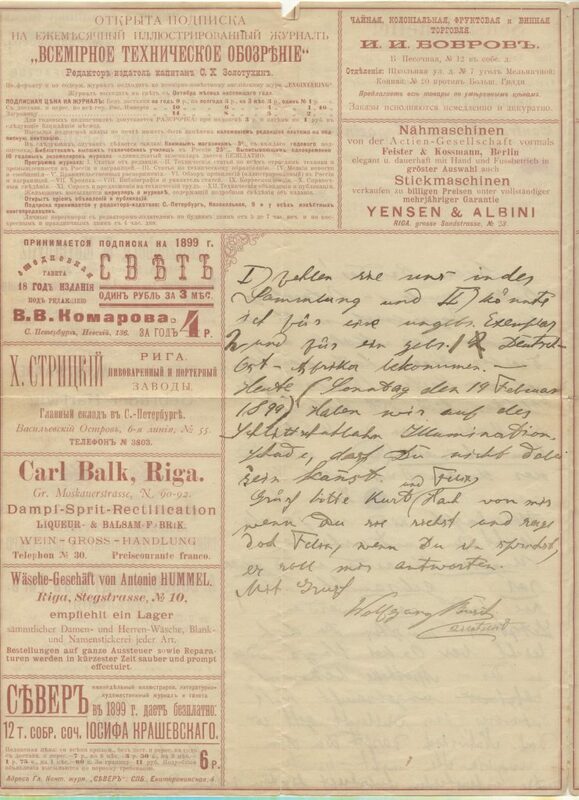 On this page with advertisements you see some advertisements from Riga, the sheet is issued in Riga. Above you see the advertisement of the ФАБРИКА [FABRIKA], factory, АНГЛIЙСКИХЪ [ANGLIISKIKH], English, ЛАКОВЪ И ИКРАСОКЪ [LAKOV I IKRASOK] , paints and varnishes, the company C. King in St.Petersnurg. Left the address in S. Petersburg is mentioned, in the center, so it is probably an office or warehouse (‘sklad’), with branches in Moscow, Odessa and Warsaw. At the top, right side, the varieties of paints are mentioned. Here an advertisement of a brewery is placed: Strizky. The very known brewery Strrizky, opened in 1854 on Nikolaev street 75/77 (nowadays A.Briana), was in 1913 the greatest and most profitable in Riga, excluding the Ilguciema brewery. 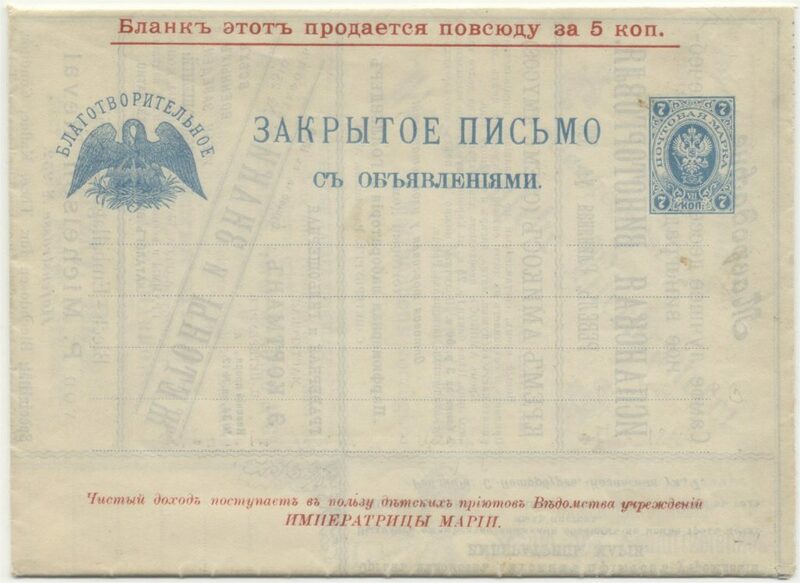 In a message, October, 1918 the cost of the evacuated equipment from the brewery is mentioned: about 165 000 rubles. The factory equipment was taken out to Moscow, but has subsequently disappeared. More about this brewery: http://www.valdemarapasaza.lv/en/history. Here the right side after open third time: here you see the two narrow gummed strips for sealing the envelope. In the right column some advertisements are placed by companies in РЕВЕЛЪ [REVEL], now the Estonian capital Tallinn.